I noticed this book on the store shelf because of the two authors. Each year we take a study trip to the UK including Edinburgh, Scotland and attend the historic Charlotte Baptist Chapel founded by Robert and James Haldane. Both of these men have pastored at that church, Begg being the assistant to Derek Prime. 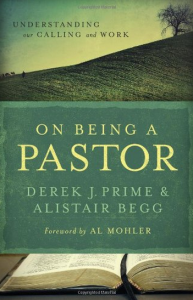 This book leans toward the practical side of the pastoral ministry, both men giving their advice and using themselves as examples of “how I did it.” There is special emphasis on keeping details and following through with assignments but also refreshing discussion of the pastor’s prayer life and study time.